Symptoms:No symptoms were reported with turnip. Food/Type of allergen:Purified turnip protein (concentrations of 10 and 100 µg/mL in PBS, pH 7.2). Protocol: (controls, definition of positive etc)A wheal larger than half of the reaction caused by histamine dihydrochloride (10 mg/mL; ALK, Copenhagen, Denmark) was regarded as a positive reaction. Number of Patients:Skin prick testing was performed on 6 patients allergic to NRL with IgE antibodies to prohevein (Hev b 6.01) and hevein (Hev b 6.02) in ELISA. Summary of Results:Hanninen et al. 1999  found that 4/6 natural rubber latex allergic patients gave positive SPT to the purified turnip protein (25 kDa by SDS and 18.7 kDa by mass spectra). 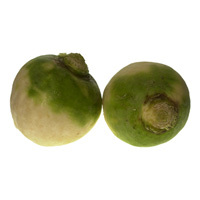 Food/Type of allergen:Extracts from fresh or salicylic acid or ethephon treated turnips and a purified turnip protein (25 kDa by SDS-PAGE and 18.7 kDa by mass spectra). ELISA (Mikkola et al. 1998 ). Number of Patients:34 adult NRL (natural rubber latex) allergic patients (mean age 37 years) and 26 NRL allergic children (mean age 7 years). Summary of Results:Sera from 30/34 adult patients and 21/26 children bound to the 18.7 kDa turnip protein while all 62 control sera were negative. Immunoblotting separation:1D separation on SDS-PAGE (13% acrylamide) by a modification of Mikkola et al. (1998) . Samples were boiled for 3 minutes in reducing buffer. Immunoblotting detection method:Samples were transferrred to PVDF membranes (Millipore, Immobilon-P), without cutting into strips, and blots developed as in Mikkola et al. (1998) . Immunoblotting results:Sera from 12 patients allergic to natural rubber latex (NRL) (11 women and 1 man; mean age, 41 years; range, 22 to 64 years) bound a 25 kDa turnip protein and the binding was inhibited by NRL or prohevein (Hev b 6.01) or hevein (Hev b 6.02). Weaker binding to a 14 kDa band was inhibited by NRL. The bands were much stronger after treatment of the turnip by salicylic acid or ethephon. Hanninen et al. 1999  show that there is potential IgE cross-reactivity between prohevein (Hev b 6.01) or hevein (Hev b 6.02) hevein from natural rubber latex and plants such as turnip. Five fragments of the sequence of the chitin binding protein, Bra r 2, showed 70% identity with Hev b 6. Hanninen et al. 1999  studied the induction of IgE binding proteins (allergens) cross-reactive with natural rubber latex, NRL, in turnip. They found that salicylic acid or ethephon (an ethylene-releasing agent) induced the allergens. The SPT results above on NRL allergic patients are the evidence that this may have clinical significance. Turnip has also been shown to cause contact allergy (Munoz-Bellido et al. 2003 ). Hanninen AR, Mikkola JH, Kalkkinen N, Turjanmaa K, Ylitalo L, Reunala T, Palosuo T.
Increased allergen production in turnip (Brassica rapa) by treatments activating defense mechanisms. Munoz-Bellido FJ, Moyano-Maza JC, Alvarez-Gonzalo M, Terron M.
Protein Family:Two domains: PFAM PF00967; Barwin family and PFAM PF00187; Chitin_bind_1. Nature of main cross-reacting proteins:Cross-reacts with hevein, Hev b 6.02, from natural rubber latex. Similar proteins are found in tomato and potato. Allergen properties & biological function:Pathogenesis related PR-4 family. Allergen purification:Slices of frozen turnip root were homogenized in an equal amount of ice-cold water and mixed 1:2 (wt/vol) with 20% acetonitrile (ACN) containing 0.1% trifluoroacetic acid. After stirring and filtering through a 0.45-µm membrane (Millex HV; Millipore, Molsheim, France), the extract was chromatographed (without concentration) on a linear ACN gradient from 15% to 60% in 20 minutes by HPLC. Affinity binding to and elution from chitin were used for further purification followed by reversed-phase chromatography on a ReSource RPC 3-mL column by using a linear gradient of ACN (0% to 60% in 40 minutes) in 0.1% trifluoroacetic acid at a flow rate of 1 mL/min (Hanninen et al. 1999 ). Other biochemical information:The sequence P81729 consists of five partial sequences of tryptic peptides (Hanninen et al. 1999 ).